In North America, the temperature is dropping, and Thanksgiving is behind us. That can only mean one thing: Christmas Bird Count season is upon us! The annual Christmas Bird Count (CBC), which started in the year 1900, is one of the longest ongoing citizen science projects in the country. It began as a conservation effort to offset the impacts of the now-defunct Christmas “Side Hunt” during which hunters competed in teams to see who could shoot the highest number of animals. Today, CBCs continue to encourage birders from both North and South America to get outside and “hunt” birds. For researchers, the data they collect is useful in determining bird populations, migration patterns, and effects from climate shifts. For the data collectors, CBCs are a fantastic excuse to bird all day long! Recent Sightings: BirdsEye compiles lists of ‘Nearby’ sighted avian species in your area. Using this feature, you can see recently submitted species in the area, and you can study the potential species you and your team might run into in the field during your CBC day. Knowing which species to expect can help you study field markings and decrease the amount of time you might spend identifying birds in the field, opening up more time for birding! And what’s better than that? The BirdsEye Smart Search feature can you help you narrow down which birds you may see in the habitat in which you bird.Habitat Preferences: Not only can you search sightings nearby to you, but you can use the Smart Search feature to explore what types of birds are likely to be found in the habitats you’re observing during your CBC. 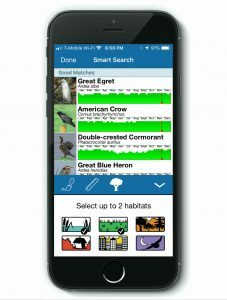 For example, if you’re primarily birding in a grassy field, select the field icon to see which bird species spend time in that type of habitat. Are you going to be in a wetland? Select the wetland icon. Will you be investigating a habitat that could qualify as both? Select both icons! The tool will organize species that are highly likely to be in specific habitats in your CBC circle. Without Service Service: Sometimes, CBC counts take you into areas far from cell phone service. Don’t let that hinder your birding experience! 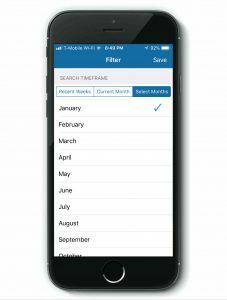 With BirdsEye, you can download sightings lists before your CBC day, which can serve as quick checklists in the field. You can also download all of the BirdsEye content for offline use. It can take some time to complete the full download, so be sure to download this data before you head into the field. Use the BirdsEye Smart Search feature to discover birds based on color, size, and habitat. There are a few added bonus capabilities for BirdsEye Members on iOS devices. 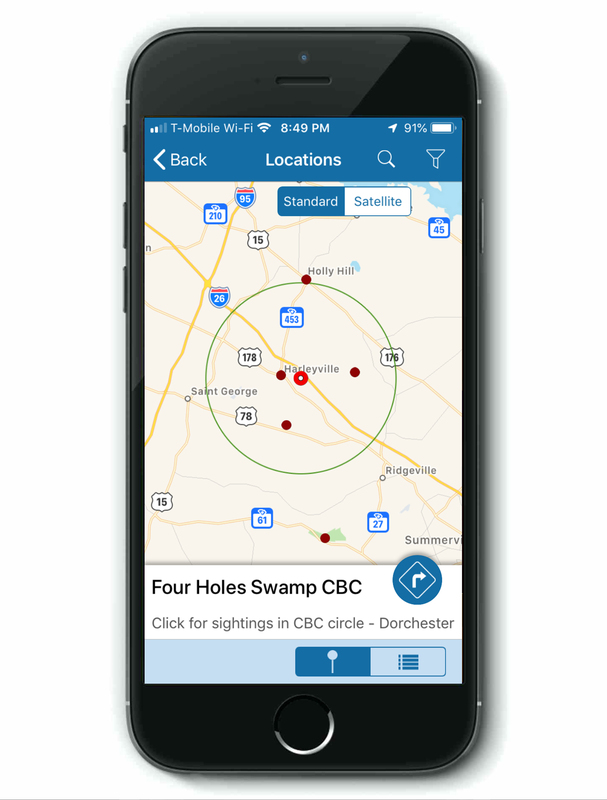 CBC Circles: BirdsEye populates CBC circles on the ‘Browse by Location’ feature of the app. You can select circle from the map and explore species recently spotted in the CBC area. Christmas Bird Count circles (15-mile wide study areas) are included in the BirdsEye for iOS app. Month Parameters: North American iOS users also have the option to narrow nearby sightings to a date range. This way, you can explore what types of birds have been seen in December and January in your area for the last seven years. In so doing, you are able to see which birds have not yet been seen this year but could still be sneaking around out there. North American iOS users also have the option to narrow nearby sightings to a date range. North American iOS users also have the option to narrow nearby sightings to a date range. Regardless of where you are this CBC season, let BirdsEye help you optimize your experience! From everyone here at BirdsEye, we hope you have an amazing CBC season! Click here to learn more about Christmas Bird Counts and join one near you. We receive CBC location data from the Audubon. If you notice an issue with a CBC circle on our app, please contact us.